Successfully Added Drone Simtoo Dragonfly Pro - 4K Camera, Follow Me, Panoramic Shot, Foldable Design, Point Of Interest, Auto Hover (Red) to your Shopping Cart. Say hello to the Simtoo Dragonfly Pro drone. This 4K video drone features a cool and exceptional design, truly making it stand out from the crowd. Crafted out of lightweight yet durable material, this video drone is capable of withstanding a hit and can be easily carried around. Its portability is further increased thanks to its foldable design. Equipped with a high-end 16MP camera, this video drone is capable of shooting ultra-HD 4K video. Its 170-degree lens and 3 axis gimbal will provide you with all that’s needed to shoot stable and professional-grade video while cruising through the skies. Featuring a built-in GPS system, the Simtoo Dragonfly Pro drone supports an abundance of intelligent flying functions. The drone itself is capable of flying at speeds up to 20m/s, letting you cruise through the skies and reach destinations in your near proximity in no time. Being easy to maneuver, this drone is capable of keeping up with all your outdoor activities. Allowing you to fly up to 120 meters in height, and supporting a stunning 1000m control range - this amazing drone offers plenty of possibilities for you to explore. The fact that this RC drone is easy to control makes it the perfect Quad-Copter for both beginning drone pilots and advanced enthusiasts alike. Packing an epic battery, this 4K camera drone is capable of flying up to 25 minutes continuously. All this power provides you with great opportunities to take off and shoot some stunning 4K video from above. Its camera can be synchronized directly with the dedicated mobile application – providing you with amazing FPV shots and the possibility to share footage instantly via social media. What sets the Simtoo Dragonfly Pro drone really apart from its competition is the fact that it comes with its own RC watch. This amazing wrist controller has a reach of up to 50 meters and allows you to fly your drone without needing to hold a large controller. 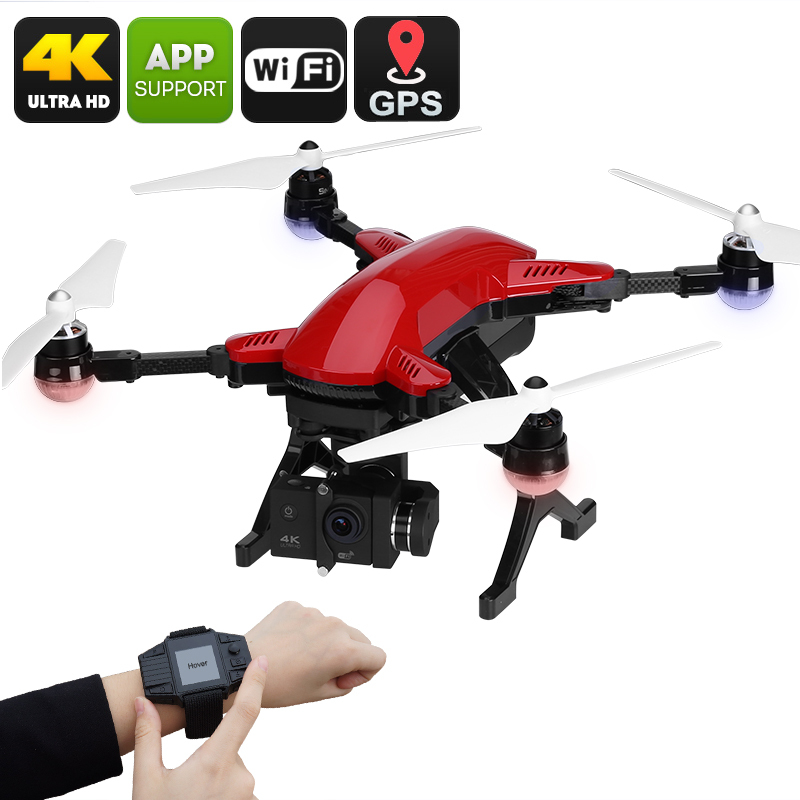 Besides its RC watch, this 4K camera drone naturally also comes with its own remote control. Supporting an abundance of intelligent flight modes, this amazing drone can hover in place, follow you on command, or orbit around a certain object or location. Additionally, it features an auto return to home feature to make sure you’ll never lose track of the whereabouts of your beloved video drone. The Simtoo Dragonfly Pro drone comes with a 12 months warranty, brought to you by the leader in electronic devices as well as wholesale electronic gadgets..